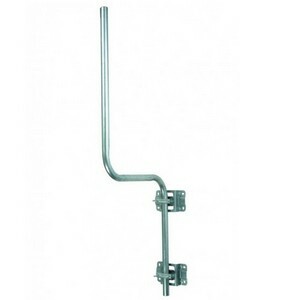 Heavy duty swan neck mast with 2 wall brackets attached for easy and secure installation. • Suitable for the installation of both aerial and satellite installations. • Unobtrusive alternative to traditional T&K wall mountings. • Light and Easy to install for heavy duty applications. • The mounting brackets can be easily positioned to suit. • 18 stand off for eaves applications. • Offers 4 fixing points per bracket for additional strength. • Supplied complete with double brackets and mast.